Hummus used to be one of my go to snacks. It’s so versatile and can be paired with all types of dippers, from pita chips to carrots to your fingers! However, turning to a keto lifestyle has meant adapting a lot of my “go to snacks” to make them low carb and keto-friendly. I’m positive many of you can relate to the process of revamping your snacks, and I’m even more positive that you’ve become just as creative as me in doing so. 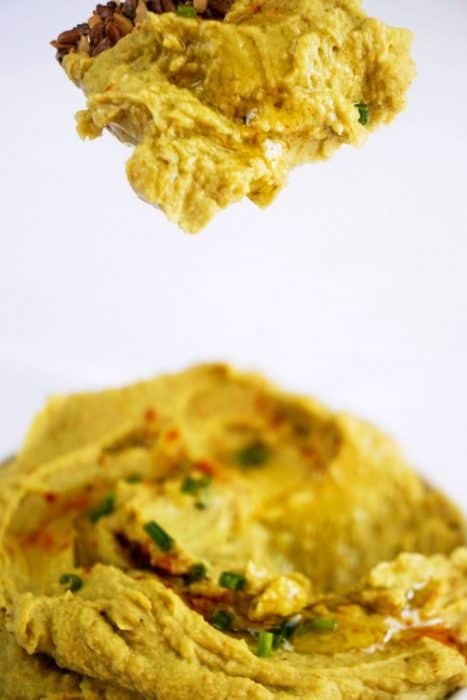 Although garbanzo beans, in the form of hummus, aren’t terrible in terms of nutrition – 4 net carbs per 2 tbsp serving – it can always get better. So, we took it upon ourselves to make it better by way of a fatty, ripe, and deliciously green avocado! Finding an avocado that isn’t $17 dollars almost beats Christmas morning for a 7 year old girl getting all her favorite barbies. Opening it at the perfect point of ripeness not only beats that Christmas morning, but adds on finding a $17 dollar bill to replace the cost of the avocado. 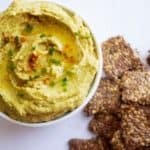 On the day I decided to make this Avocado Hummus I didn’t want to risk getting an unusable one (you know the kind i’m talking about!) so I headed over to the organic section. I hesitantly spent $3 dollars on one avocado, and I hate to say it, but it was absolutely worth it. I can’t recall the last time I opened such a perfectly ripe and green avocado. However, now looking back it was probably all just the luck of my choosing! Believe it or not that was the toughest part of this recipe. The rest requires you throwing all the ingredients i’ve provided to you below into a processor and pulsing until smooooooooooooth. Not smooth enough? Pulse again. At the very end I folded in some jalapeños for extra flavor and color. I paired it with some cucumber chips and brought it to a Friendsgiving. Needless to say, it was a HUGE hit. Full Disclosure: Matthew and I just listened to a podcast on organic vegetables and there actually is no true difference. Studies have shown that slapping the name organic onto non-organic products makes people think they taste better. Combine all ingredients in a processor. Taste test. Chill in fridge and serve cold with cucumber chips!